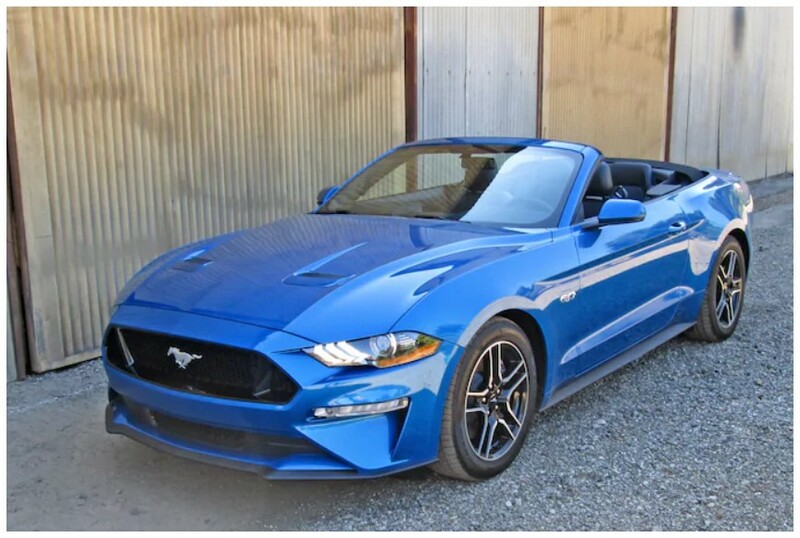 One second after opening the Velocity Blue driver’s door of the 2019 Mustang GT Convertible that showed up on my doorstep, I knew very good things were in store. There, atop a stubby stalk in the center console, sat the fat ball of a six-speed manual shifter. A brand-new, rear-drive car with a bona-fide manual transmission — coupled to a throaty, muscle-rippled naturally aspirated V-8! Talk about rare … I almost felt like I’d just bagged a unicorn. The Mustang GT harks back to the glory days of the muscle-car era all right, but it’s better in ways that the rubber-burners of yore could only dream about — friendlier, safer, better-handling, and, yes, faster. The 5.0-liter V-8 is a glorious motor, good for 460 horsepower, 420 pound-feet of torque, and a booming, howling exhaust note that’ll rock you straight into the chase scene in “Bullitt.” Mash down on the gas and this comfortable, conveniences-laden two-door will romp to 60 mph in just a blink over four seconds with nary a blip of wheelspin — unless you like intentionally smoking your rear tires (launch control is standard, by the way). The V-8 redlines at 7,500 rpm but feels like it could spin past 10,000 with ease. It’s unfailingly smooth, eager, and bursting with character. And that sound! Especially when blaring out of the optional active-valve performance dual exhausts with quad tips ($895) — which allow the driver to select the amount of exhaust volume — it’ll keep your heart rate racing in the triple digits for as long as you’re behind the wheel.